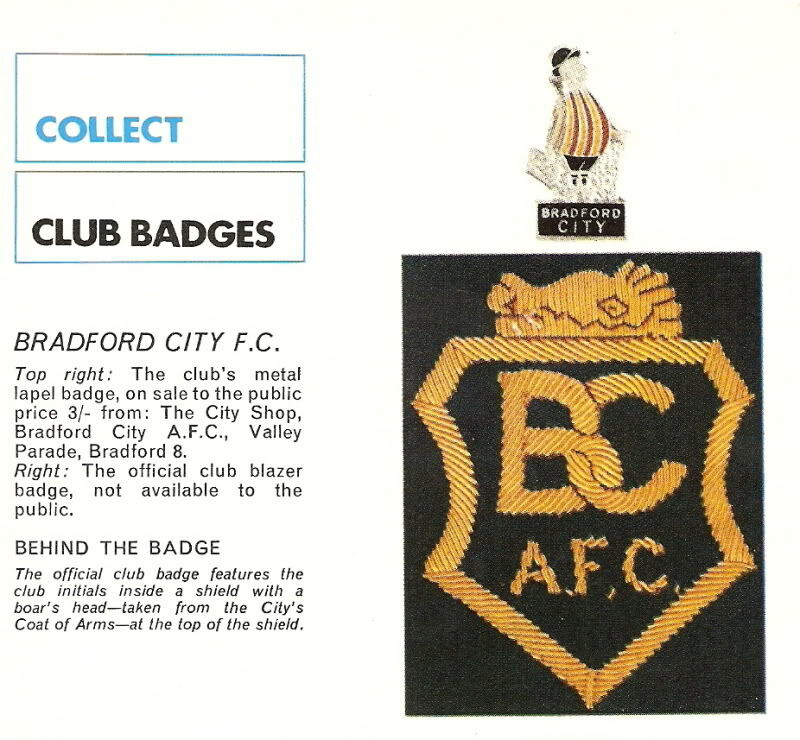 I haven’t been able to find any definitive dates surrounding the Bradford City badge so all Ive done is document the pictures Ive found in what I believe is the correct date order. 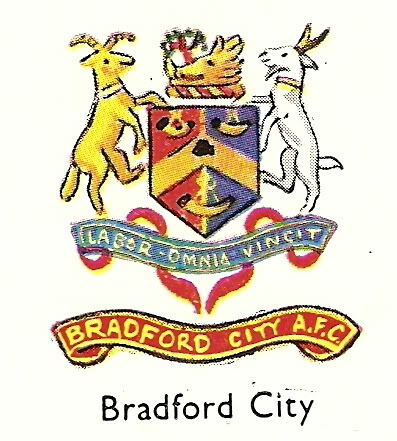 The first Bradford City football badge I could find was in the 1959 Encycopedia Of Sport and it seems to be a version of the towns coat of arms, the motto by the way is "labor omnia vincit", meaning "hard work conquers all", a fairly appropriate motto for any football club. The next example of the football badge I found was in the Football Review magazine from the late 60’s. Interestingly only one element of the original remains and that is the Boars head on the top. The story behind this is that it was incorporated into the coat of arms after a wild boar that was causing mayhem in the area was killed for a reward, legend has it that 2 people claimed the prize, one of whom had cut out the tongue as proof , hence the boar is always shown as being tongue-less. Following on from the Boars Head badge there was then a City Gent emblem, apparently modelled after a famous club director, we aren’t sure though whether this was an official football club badge or not though and cant find out a lot of history behind it, he can be seen above the Boars Head image above, unfortunately we weren’t able to find a decent image of him, perhaps further proof that he wasn’t an official club badge? From what we can gather the next change was to the current badge used by the football club and that is the Bantams crest. On the top of the badge a Bantam, theres a couple of theories as to why Bradford City are nicknamed the Bantams, one is that the nickname was because of the similarity between the Club's traditional colours of Claret & Amber and the plumage of Bantams. The second is that it originates from the days when the groundsmen at Valley Parade had to clear chickens/bantams from the pitch before games. The shield itself is made up of the colours of Bradford City with the football clubs initials inside, and to finsh it off the scroll underneath features the clubs nickname.